In downtown Los Angeles we are lucky to have the Frank Gehry designed Walt Disney Concert Hall. It opened in 2003 and is home to the Los Angeles Philharmonic. Since it's a Gehry design, the building is really striking with its curved, stainless steel exterior. I've never been inside for a concert but have walked by many times. I was a little surprised when the location for a Thursday paint-out was to be the Disney Hall! Our organizer recommended that "abstract" be our theme for this building. Well, since the building is already "abstract" as buildings go, it was a pretty easy task. But, I was ready with some different materials to try something non-representational. I did two small gouache pieces, the first more abstract. People who stopped by to see what our artwork looked like, expecting to see the neat building, couldn't really find anything to say about our "abstracts". At our casual critique, fellow painters seemed to like my less abstract piece best, mostly because of the yellow fire hydrant. The day was very dreary but so much fun to be in busy downtown with the group. An evening shot with the sun going down. A wedding shoot while we artists were there. This day was Angelino Heights "revisited" for the Saturday paint-out group. I posted my painting of Bob's Market from our first visit a few months ago in Bob's Market. Angelino Heights is in the Echo Park neighborhood of Los Angeles, not far from downtown. Since it's a hilly area there are great views of downtown. And being one of the oldest neighborhoods in Los Angeles, there are some charming and eye-catching old homes to paint. Some of the old homes are Victorian and well-kept. The one that turned out to be in my view of the downtown buildings that I wanted to paint was very run down, deserted, and boarded up. 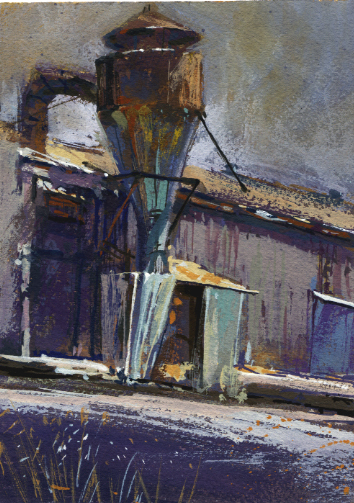 I don't usually get into many details while plein air painting anyway so it was okay with me. 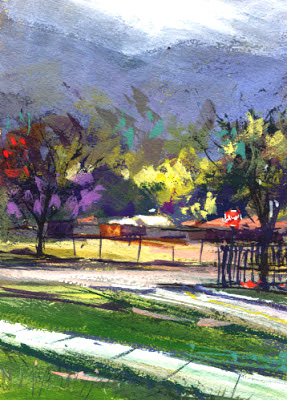 I had time to also try a smaller gouache piece from my painting spot in a parkway, under a tree. There was a cat watching from a window in the house in back of me for most of the morning. Many cars are always parked along the streets in this neighborhood and I really should try adding some to my paintings. 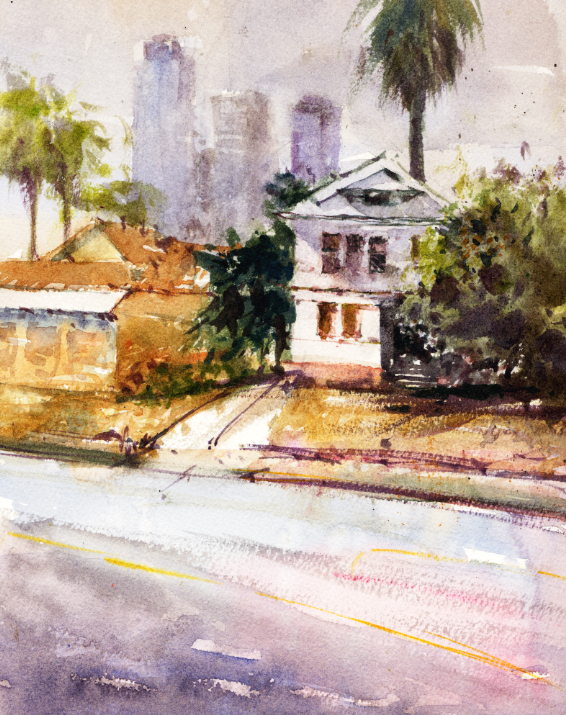 There are many more views to paint in Angelino Heights and I'm looking forward to more visits. I painted this gouache piece in July at the Saturday paint-out location in Alhambra, CA. It's an old industrial area which is being demolished. We painted here once before and I posted that painting in Industrial Decay. We painters in the group seem to love this type of subject. This device, the Cyclone, collects sawdust from the air at a cabinet factory. It's an old, out of date one, not current with clean air regulations. It's rusty and I thought it looked great in the early light. 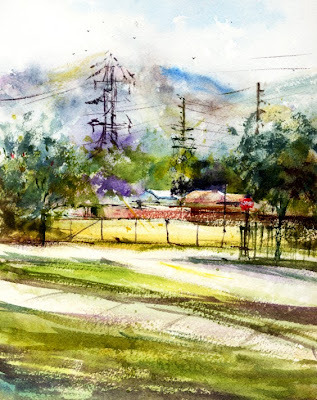 As it happened, in the online watercolor workshop given by Vinita Pappas, Create 38, the August Challenge is titled Pretty Ugly. We are to paint something that at first might appear ugly or unsightly, finding the hidden beauty in it for our painting. My gouache of the cyclone was perfect for the challenge! Another plein air piece that would qualify is my The Power Plant watercolor. I'm attracted to these subjects it seems. This is in the same block as the photo above. Next time! Of course it can also happen that the painting itself doesn't go as we had hoped and might turn out to be unattractive, maybe "ugly". 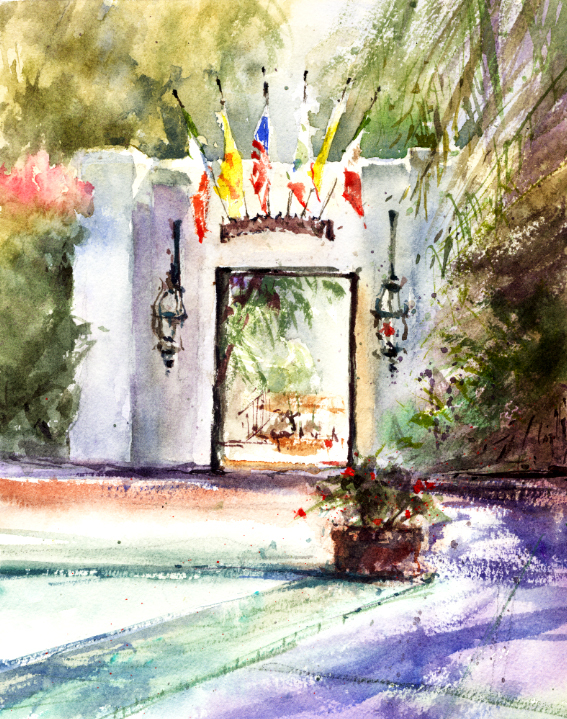 I attended a demo yesterday given by Kathleen Conover at the National Watercolor Society headquarters. Kathleen has a use for unsuccessful paintings. She paints over them and turns them into her amazing, personal pieces. When I saw one of her paintings in person I had no idea how she achieved her beautifully textured surfaces. I signed up for her demo and I'm so happy I did. Kathleen showed us how she works, painting over other paintings in several steps. The process Kathleen developed has many possibilities and it was terrific to be able to see how she paints. My favorite series of hers is titled Industrial Evolution. In the photo below Kathleen is showing the finished second stage, a painted-over painting with calligraphic marks. Next she paints her composition over this while letting the background show through in areas. The Caltech (California Institute of Technology) campus in Pasadena is really a gorgeous spot. Over the years I've walked through, taken photos, and was always struck by its beauty. The master plan for the campus was laid out in 1917 and several buildings were designed then to fit in with earlier structures, and with Southern California. There are several surprising decorative accents of bright California tile used here and there on the buildings. The many tall eucalyptus trees really add to the charming atmosphere there. I was thrilled when the Saturday paint-out group had Caltech on the schedule. Since it was a Saturday in July, I'm sure there were more joggers and dog walkers than students. I spent quite awhile walking around checking various locations I had enjoyed seeing on previous visits, the turtle pond, etc. looking for possible painting views. I finally settled on trying a gouache piece of Dabney Hall, one of the 1917 buildings, which struck me as soon as I saw it with its pink walls and accents of turquoise tile squares which looked like confetti. Wow, it was stunning in the morning light. 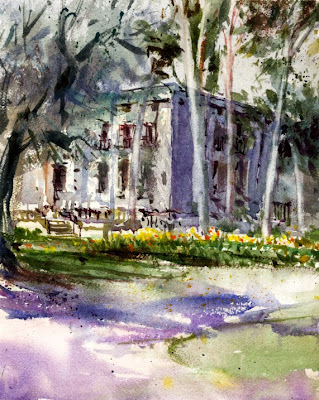 And while I was painting that view, I could look to my right and paint the dramatic Hall of Administration in watercolor. 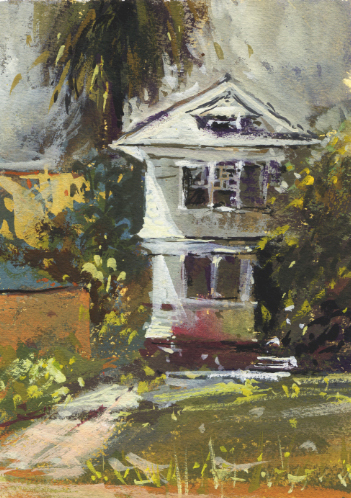 The changing light on the building and the eucalyptus trees with their white trunks proved to be challenging. It's plein air painting, always a bit of a challenge. Such a fun paint-out location. 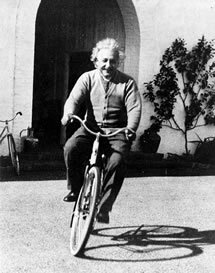 Albert Einstein riding a bike at Caltech. Anyone in the Los Angeles area in the '80s probably visited the Lawry's California Center. It was a large and beautiful facility featuring restaurants, gardens, and a tour of Lawry's Spice packing plant. Unfortunately it closed in 1991. It's reopened now and renamed the Los Angeles River Center and Gardens. It's a center for the LA River restoration, community events, now operated by the Santa Monica Mountains Conservancy, a state agency. The facility has had part of its original property cut off but it's still a very lovely setting to visit with historic buildings and gorgeous, well kept gardens. A perfect location for painting! The Saturday group met at Lawry's in June and it was a shock to be there again after so many years. The flowers and fountains seemed to be more striking than they ever were. Maybe that's because of my new experiences with plein air painting in mind. The morning we were there the light seemed so beautiful in the walled gardens. We were the only ones there besides some maintenance people preparing for an event in the afternoon. It was a hard decision on what to paint. The grouping of purple Agapanthus plants was stunning. 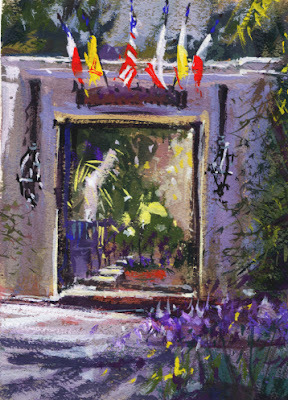 I chose a gateway with an array of flags that I kept coming back to and tried a watercolor and a smaller gouache. I'll be painting there again soon. I can hardly believe it but almost exactly a year ago I posted the watercolor I painted at the San Gabriel Mission Playhouse in Mission Playhouse. Since then I've painted there on two other days and I'll share those paintings. 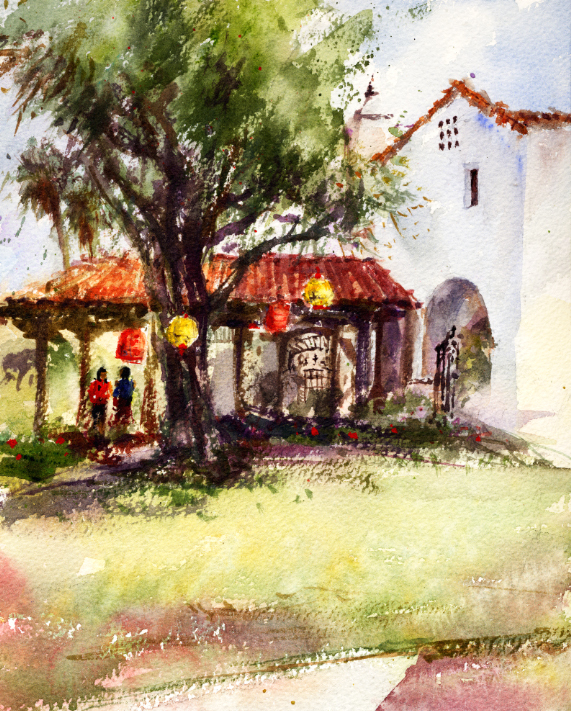 The Playhouse is just a block from the historic San Gabriel Mission, 1771. 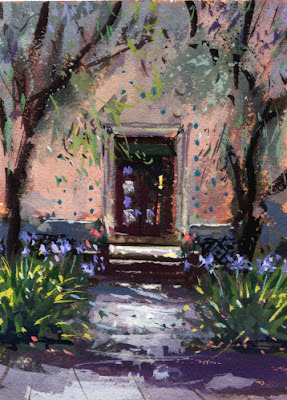 In April the Saturday plein air group met at the Playhouse. There were some festivities going on including a small crafts fair. Very pretty tables were set up and there were lanterns hung in the tree. That's the view I chose to try in watercolor. The next time I was there to paint was with the Friday plein air group. The show we had in July of our artwork was at the gallery adjacent to the Playhouse. We thought some artists in action, doing some painting might get the attention of people in the area. It was a very overcast day so I chose to try a gouache piece since my watercolor washes would have a hard time drying. 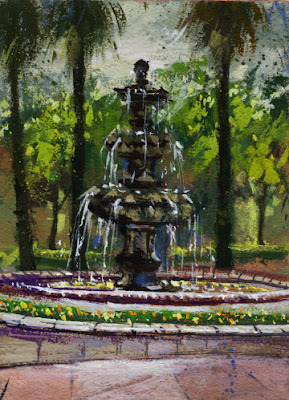 It actually drizzled on me as I painted the fountain and I had to move twice. Most of the group painted a still life set-up in a covered arcade area near the gallery entrance. My photo of them is below and I wish I had time to try painting the still life as well as the fountain. Such a lovely location. 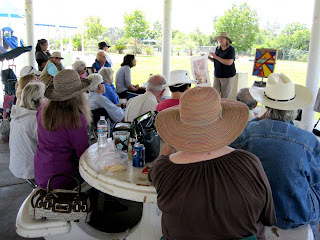 I hadn't been to Vina Vieja Park in Pasadena before the Thursday's En Plein Air group met there. We had some "June Gloom" haziness in the morning. The San Gabriel Mountains are very close when you're at the park but their tops were covered in haze. The park is located under many transmission towers and power lines. There are two dog parks adjacent, one for big dogs and one for shy or small dogs. I chose a view in the direction of the hazy mountains, across a vacant lot that had some nice warm light on the golden weeds. Some transmission towers and utility poles added some interest. I did a watercolor and while my washes were drying I painted a smaller gouache. For some reason I like the way these both turned out even though the subject matter is "different". I wish I could have gotten some photos of the dog park dogs but it was so big that they just dashed away. The sun eventually came out and our large group that day had a nice chat about the artwork. Yes, a whole year of participating in the Virtual Paintout! I've had a lot of fun virtually looking around cities all over the world. Bill Guffey created the Virtual Paintout and selects the month's location. 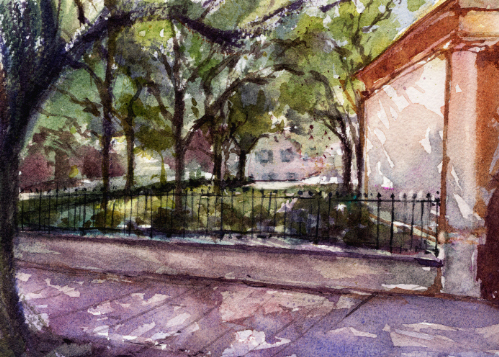 Artists use Google Street View to find their view to draw or paint. We submit the artwork to Bill and he posts everyone's work on Facebook and on his blog. For July 2013, the paintout location was Charleston, South Carolina. I've never been to Charleston and it was a very beautiful city to look around. Many striking tree-lined streets and old buildings. The very first spot I looked at was something wonderful to paint. I did a small watercolor of that location on George Street. 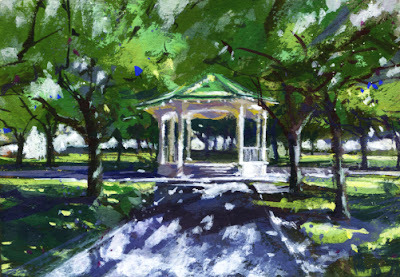 There is a pretty harbor I was considering, but for a second piece I chose the gazebo in White Point Gardens. It's a 5x7" gouache. Such an exciting project. I'm looking forward to more virtual paintouts.